There are several reasons to keep a Tarot journal…but the most significant one is that it will make you a better reader. No matter what level you’re on, the process of journaling is illuminating. If you’re a student, it helps you become acquainted with the cards. For longtime practitioners and professionals, the connection to each card deepens. Keeping written notes will assist you in tracking your own progress. A written record of your readings- whether for yourself, friends or clients- allows you to look back, seeing how the various situations the cards showed you played out. Another benefit of keeping a journal is expedited learning through your own personal experiences. If you’ve been devouring every book on Tarot you can get your hot little hands on, undoubtedly your mind has absorbed the key words and phases for each card. However, those interpretations – no matter how academic or correct- are the opinions of others. Keeping a journal practically forces you to formulate your own ideas. You’re our feelings and intuition provides guidance-and ultimately, knowledge- while you handle, relate to and write about the cards… and that is precisely where you will grow as a reader. 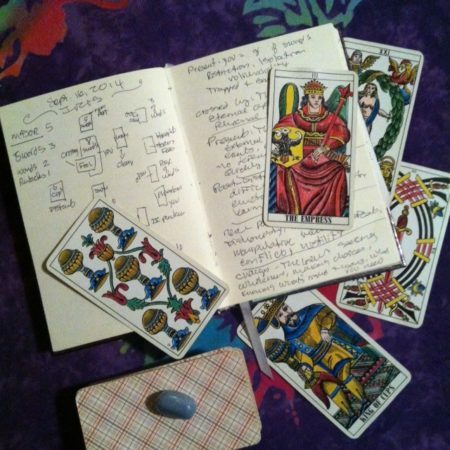 Often, newer readers or even those who haven’t studied this way previously are unsure of what to include in their Tarot journals. Really, there are no hard and fast rules. Remember, this is for you. Here are some Tarot journal ideas… use them as a jumping off point. Shuffle your deck and pull a card. Instead of applying key words and phrases- and without looking up the card’s meaning if you’re not sure of it, simply observe the card. Explore everything- notice every little detail, and your emotional responses to it. Every card has correlations with numerology, astrology and the Kabbalah. The suits of the Minor Arcana each relate to an element. Explore all of these connections. What catches your eye first- is it the imagery, the colors used, the numeral on the card face? How does the card make you feel? Can you relate to it? Do you like or dislike it? Why? If you own a few decks, draw the same card from a different and compare the images. What makes them similar or different? Do you relate to the image in the same way as you did the first version of the same card? If you only own a single deck, you can still contrast cards- download some images from the Internet and do your comparisons that way. Take notes on everything you’ve noticed about each particular card in your journal. Remember, each card has it’s own correlations with numerology, astrology and the Kabbalah, too. The suits of the Minor Arcana each relate to an element. Explore all of these connections. With seventy-eight cards, there’s no way you’re going to get bored, because this exercise on it’s own could practically fill an entire book! For spreads that involve a number of cards, such as the Celtic Cross, another good thing to make notations on is the number of Major Arcana cards, and the dominant suit- both of those are important for future reference. Do certain cards really resonate with you? Does The Star feel like it’s “your” card, do you emulate The High Priestess or get the Warm Fuzzies every time you see the Six Of Cups? Write about the cards you love…and why you love them. It’s also important to explore the cards you don’t like as much. There are certain cards that may be a bit off-putting to the general public, like Death Or The Devil. As readers, we understand early on that essentially, there is no “good” or “bad” cards- they all have both qualities…and we spend ages trying to educate our students and clients on that, too! However, there probably are some cards that you personally don’t like as much as the others, for whatever reason. If you aren’t “that into” a card, all the more reason to explore the reasons why. By journaling about it, you might feel a new connection to it…or realize that the qualities the card hit a little close to home. It could be that the card signifies something that’s lacking-or needed- in your life. Go through your deck and pick out a few cards that most represent the significant people you know, such as family members, a best friend, your boss, and so on. If your first crush was like The Magician, your sister is a total Queen Of Wands, you have a pal who’s really Eight Of Swords-like or the Two Of Cups describes your relationship with your cat, write about it! It’s always a good idea to get readings from others- no matter what level they’re at. Other readers can often pick up on things you can’t; they’re also able to be more objective than you are when you read for yourself. But getting a reading from a seasoned professional is always illuminating. It will be a good experience for you’re personally, but it can also inform you intellectually, and help you to grow as a reader. If you can make a recording of the reading, definitely do that. But even if you can’t, there are several things to appreciate. Watch (and write about) the way the reader handles the cards, what spreads they use, and how much time they take to absorb the card’s meanings before they start speaking. Listen to the tone of the reader’s voice- is it soothing? How do they discuss “tricky” cards with you? Does the reader offer counsel or do they just tell you bluntly what each card means? Did they answer any questions you had? How would you rate your overall experience? Would you get another reading from this person? By dissecting your reading, you can learn a lot about yourself, the cards themselves, but also about speaking to and relating with others during a reading that you do. You don’t need to work with your cards and write in your journal every day… but if you want to master the Tarot, you will.